Belize NMS: Moisture has decreased over most areas of the country. 24-hour forecast: Cloudy and cool with a few showers and periods of rain mostly over the south and along coastal areas tonight.... then decreasing over the northern and central districts tomorrow. Winds: North - northeast 10-20 knots with occasional higher gusts. Today: Winds: N-NE 10-20 kt with higher gusts. ; seas: Moderate - rough. ; waves: 4-7 ft.; a few showers or periods of rain in the south; isolated showers elsewhere. Tomorrow: Winds: NE 10-20 kt with occasional higher gusts. ; seas: Moderate - rough. ; waves: 4-7 ft.; a few showers (mainly south). Marine Outlook: Sunday night:- Winds: NE 10-20 kt with higher gusts. ; seas: Moderate-rough. ; waves: 4-7 ft.; a few showers. general outlook: A few showers will affect mainly southern areas on Sunday morning and then increase while spreading to most areas on Sunday evening and Sunday night. I hope this is a photo of the back-end of the bad weather we've had lately. 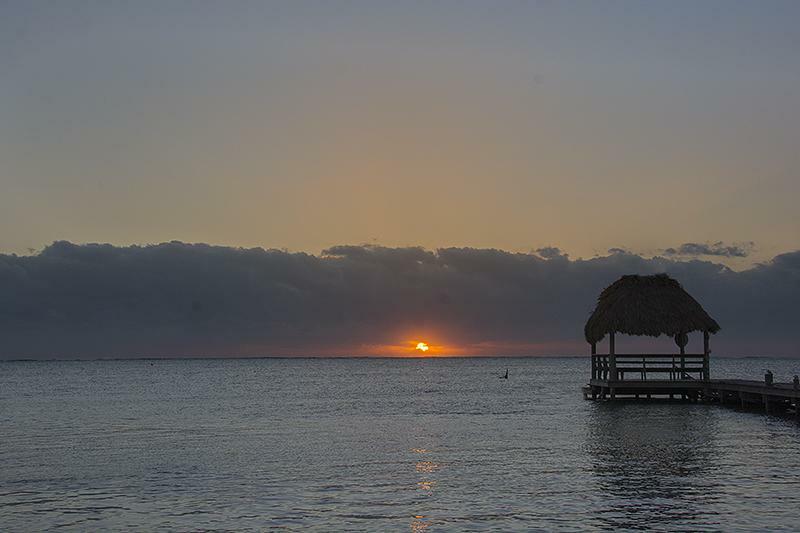 Today on Ambergris Caye we have clear sky calm sea and the expected high is 79. Well the Low level cloud for elevated fog has cleared, even though the Satellite is still showing it, so only cleared in the last couple of hours. 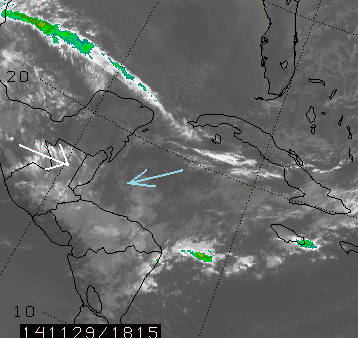 The surface wind and the mid-level clouds both coming in from direct West. . . . .The Caribbean wind is being diverted down towards Honduras & Nicaragua. . .. Cold air still streaming off the States, notably east of Florida, but all enhancing the cold bubble over Belize and beyond. I expect today to be mainly sunny. . . .Not sure if the white puffy clouds will diminish towards midday, or increase, but they will probably increase later, ... I don't see any rain around, for a day or two.. .. .Temperatures staying cold for several days. Surface wind now stopped over central Belize and lower clouds are the Cold air streaming off of Florida, bringing in more cloud, but not rain. 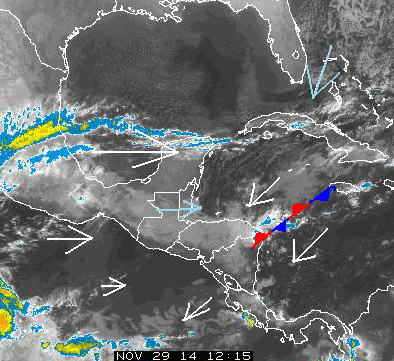 This Satellite picture is certainly hours ahead of the present NOAA. Which is showing very slightly thicker clouds coming in from the NE near Florida, but now being covered at higher altitude by cloud from the West.